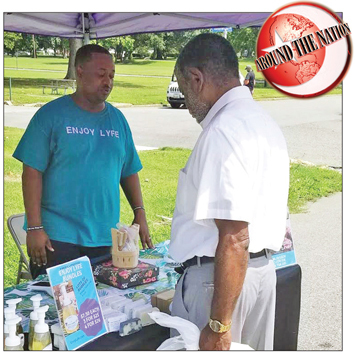 “The Minister teaches us that 100 percent dissatisfaction brings about a complete change,” Mr. Arbyummi said, referring to the Honorable Minister Louis Farrakhan of the Nation of Islam. Artiium Arbyummi selling products at a local farmer’s market. 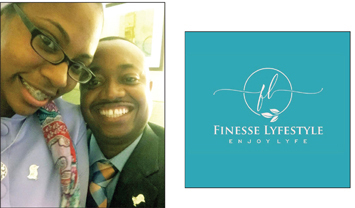 After taking many difficult and necessary steps, Mr. Arbyummi and his wife, Aqueelah Arbyummi, launched an organic personal care business titled Enjoy Lyfe. 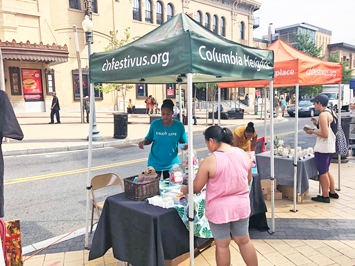 In July, they competed in the Fratport Launchpad Competition, a Shark Tank-like contest in Baltimore, and was one of two businesses out of a couple hundred who won. Along with their victory came a free year-long kiosk at the Baltimore Washington International Airport, free marketing for their business and an article published in the Baltimore Sun. Little did the Southern Maryland couple know that developing a company out of a personal need would land them this opportunity. Mrs. Arbyummi had been making soaps for a while but decided to file and process the documentation necessary to become registered as a business in March. They now have a website where they sell their own products and 600 other products from companies like theirs. Artiium Arbyummi with Enjoy Lyfe products. 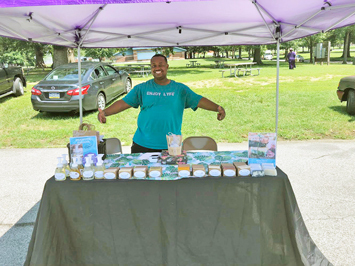 Enjoy Lyfe sells certified organic bar soap, shower gels, lotions and healing oils. They started out selling at local farmer’s markets. Along with their successes came many obstacles. “Almost everything we tried to do, there was major opposition. We actually started off trying to sell products through Amazon, and they wanted to work with bigger people who have huge volumes and we weren’t at that stage where we had the resources,” Mrs. Arbyummi said. Mr. Arbyummi said they spent the last of their life savings on a course that was supposed to teach them how to sell on Amazon, and it completely failed. Another obstacle they faced was trying to get funding. “Because we’re both college grads, we had a lot of debt so when we went to banks, they didn’t want to give us money,” Mrs. Arbyummi said. After praying about the situation, Mrs. Arbyummi said they never worried about it again. They now have a Go Fund Me campaign where people have been donating towards their cause. Aqueelah Arbyummi selling products at a farmer’s market. The couple recently went to tour the kiosk their products will be housed at and were excited. They already have plans for what they want to do after their year at the airport. Mr. and Mrs. Arbyummi recently celebrated their three-year anniversary. They encourage couples to not only be husband and wife, but to become business partners. “I decided to quit my website company completely and move into her parents’ basement to save money and Ubered to make ends meet to support her business and make it our business,” Mr. Arbyummi said. “It takes faith and truth to do it together.” Mr. Arbyummi said husbands must humble themselves. For more information visit enjoylyfe.com or on social media @EnjoyLyfeNow.